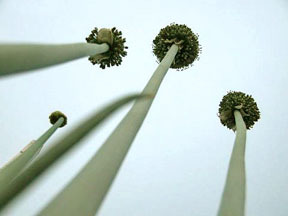 They’re 9 1/2 feet tall in the center if you’re wondering about how deep it all is. When we lived in Minneapolis, weather WAS the common point of conversation. I am not quite sure why this was: if it had one cause, say, or many. Was it because winter weather could KILL you in Minnesota, and thus isn’t it fine we’ve escaped death, or was it because it was a common point of misery thus shared? I would not say that Minnesota is filled with miserable people, so I think it was more of the former. Here in Michigan, though, winter’s really not much of a point of conversation. By the unwilling, it’s endured; by the winter-lovers, it’s smiled upon; in general, though, it’s not much discussed. I cannot tell you how far down in a typical conversation with a friend that the weather factors in: maybe Item #20, and only because the weather could interfere with our plans. Or: the conversations go like this: “Can you believe they didn’t close down school today?” when the local schools were closed due to the 8″ of white stuff that fell overnight. But I know many people read this blog from snow-shy locales; places blessed by only a few frosts in the winter months. And I know it seems, to them, just weird that we happily endure life in the snowbelt. The snow has begun to fall in earnest now (earnest means a daily 2-8″). This means my morning chore list grows a bit longer: the poultry, because they’re so numerous this year, appreciate a daily plow through their run. Their coop is in one area, I set water in another area, feed and their condominiums in a third area so that they’re forced to walk quite a bit during the day…which means I have a lot to shovel. Makes them less stir-crazy, less (literally) cooped up. And I dig out my greenhouses every morning. It’s just something I like to do, as it makes the evening quest for salad so much easier. See? Salad, in January, in Michigan! Come hungry for dinner! This entry was posted in greenhouses, weather. Bookmark the permalink. It’s just so. . . far out of my experience. You’re a dedicated poultry owner, though. I get out there every morning with treats and check-ins, but I walk over ground, not snow. If you get sick of it ever, come on out here and I’ll show you the Golden Gate. So, chickens do okay in the snow and cold? I’d love to have some chickens, mostly for the fresh eggs, but I fear that winter would just about do them in! Plus, not having a snowblower, I’d have to do a LOT of shovelling to keep a coop clear (and the driveway is usually enough shovelling in my opinion). Stef and Ellen: I guess it’s a relative thing, this cold: what I meant to say in this post is that my corner of Michigan is cold but it’s nowhere near Minnesota-cold. The coldest it has ever been here is zero! In Mpls, when our daughter was born, the high for that day was -10*. The high. Egads. All I am saying is this isn’t wicked-cold, and yes, there’s quite a difference…doing my small chores aren’t that horrible, as I am able to keep warm outside most mornings, as our daily Jan. temps are +25* or so when I do them. The chickens do okay if they have fresh fluffy straw to stick their feet in out in their condos. But if it were up to the chickens, they’d be in the coop all day, but now there are so many of them that it’s crowded, so the overflow is condo-bound. Ellen, having 3-4 birds would be ideal for you. I can’t remember how I got here, but OH, I’m so happy I stumbled upon your blog. I love the pictures, love the stories, and how I managed to get along this far without Wendell Berry is beyond me. Yay! I’m diggin’ your snow kiddo! Randi gives her seal of approval on your nicely shovelled pathways..My goal is merely to ‘try’ to keep the paths open so when it really hits the fan around here I won’t have to don the snowshoes…enthusiasm level high at the moment but subject to change. 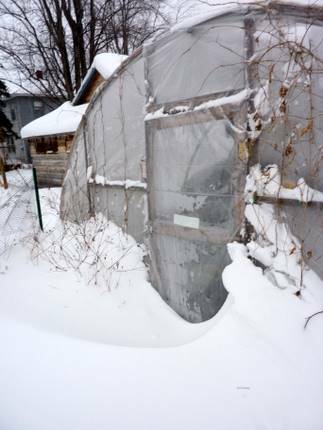 I love the pics of snow and your greenhouse…I was born and raised in MI and the thing I miss most is ice skating! Never stays cold enough long enough in MO to freeze our pond….oh well, at my age I’d probablya fall and break a hip! We are supposed to be getting a snow storm moving in…4-6 puny inches but a big deal in so. MO….our weather casters get so excited you think they’re gonna stroke out,…. 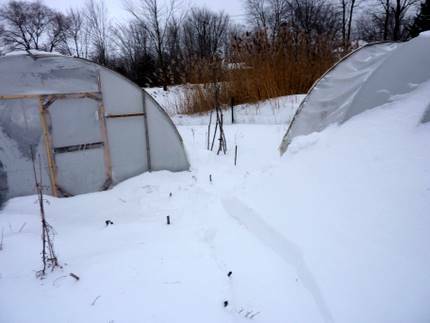 We finally got a bigger greenhouse up and this year plan to put some grow beds in the one end so I especially enjoy your posts about winter growing and seeing your beds tucked under Remay. We use it on our strawberry beds past hearing that you can get up to 60% more berries…and it is true. Last year we actually had all we could eat and plenty to freeze for the first time. 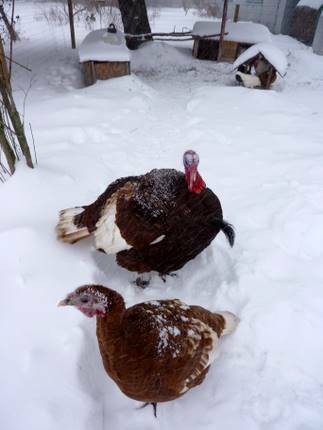 It looks like the snow has been coming down pretty good, but your abominable snow turkeys seem right at home in it. My chickens could learn a thing or two from them. 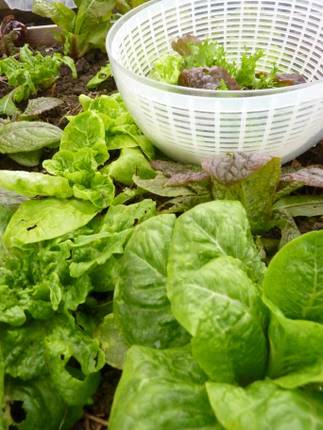 As always I am continually impressed with your lovely winter salad fixings…especially your non-brassica greens. Wish I had more of those growing right now. Here we just have cold so far, so the chickie girls are still waiting at the door to get out. I’ll be interested to see how they’ll do when we get a few inches. If they predict 3 inches of snow, school are closed here in Southern Indiana where I teach. I would take the Michigan warmth and snows over the cold here in Iowa. Growing up in Michigan my dad taught me that shoveling a driveway is an artform that a snow blower could never match. We’re in between you and MN–geographically and weather-wise–some subzero nights (and even daytime highs once in a while!) but not as much snow. our pre-christmas 2 feet of snow has now melted, with winds for 3 days – 50 miles gust – high of 15, low of 15. Sunny, if it was not for the wind, it’d be quite all right. I love the change of seasons, and winter has a beauty and poignancy of itself. This is our first winter with chicken… and we are learning. Yes, lots of straw! I am suffering from snow envy. Diana’s right about our weather reporters; tomorrow they’ll be on every fifteen minutes to tell us about the coming storm. Hopefully, it will cover the grass this time. Thanks, Jules. Someone told me that recently. How do you REMEMBER things like that though? Sheesh! Oh my gosh!!! That’s SO funny! I’m in Minnesota (it’s 15 degrees…. feels like 6) and you’re right! The weather is the hot topic of conversation. I think it is a shared appreciation that your nose didn’t fall off on the way to work or that you braved the blizzard to get milk. It’s a Minnesotan badge of honor. I do envy your 25 degrees in January. That’s t-shirt weather here! I’m in Minnesota too, and I don’t think winter weather is the most common conversation topic, except when it snows a lot, or is really cold. I think our weater is over exaggerated a lot. 25 degrees would be nicer. That’s so true above MN vs. MI winters. I am from northern MN originally and am a transplant to the Ann Arbor area. My husband has lived in MI his whole life and despises (and complains about) the winters here. He’ll say “bundle up, it’s cold outside” so I do and go out and realize that it really isn’t that cold outside. It’s just cooler :). I lived in Bemidji for the first 7 years of my life and I remember when -20 was the high for the day. Stef, and I meant to say that I would love a guided tour of your fabulous Bay area. Ellen, chickens are a bit of work…daily work, too; you need to let them out and close them up again unless you have a coop big enough for them to hang out in all the time. Chickens, cooped up, tend to get bored, so it’s wise to let them out into a run every day. And if you do that you need to close them up at night again. SO: if you’re consistently home every day, then indeed chickens can be worked into your schedule! AND: LOVE their poop and bedding. Heather! Hah, I am glad you did too! I love your sense of wackiness: I share it even if I don’t always, you know, share it HERE. Randi, three sets of snowshoes are stuck in the snow on the deck as I type this: indeed, it makes lots of sense to actually try to keep on top of the shoveling…although, of course, it STILL builds up. I end up having to dig out the coop door AND the gate to their run every.single.day, but hey, it’s a good way to blow off some steam. Mike, admittedly I did a bit of a whiff on the brassica-based greens in the greenhouses this year, and the crazy endives too; not nearly as many as last winter. That’s okay. I figure every year is different. 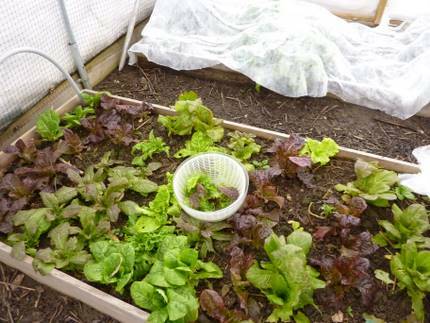 PLUS: the brassicas annoyingly don’t grow during the winter, unlike lettuces and spinach and even beets! They just sit there, whimpering, while I take all their leaves. Kimberly, rest assured your chickie girls will FREAK OUT. It is actually really quite funny to watch. Then, the bravest one will come out…especially if you tempt her with some good stuff…then the rest will too but they’ll still be complaining. Sara, thanks for confirming that 25 degrees is completely workable, even balmy. It’s 16 out right now and I swear it is absolutely freezing! My rule when I walked to work in Mpls: anything below 7, I take the bus. It’s just such a world of difference. BUT: I wish you some snow! It helps your plants if nothing else. Sylvie, yeah, that wind can really howl, right?? You need to post about your chickens! I love chicken stories. And indeed each season is wonderful: wouldn’t love spring so much if it didn’t follow the blizzard season, etc. Pamela, likewise, wish you the white stuff! If it does nothing else, it really brightens up even the grayest day. Hi Crystina! thanks for confirming: I initially thought I was crazy, introducing the weather once I moved here as a topic of conversation. “Like, what? Yeah, it’s snowing: it’s winter” was the response I would get. But indeed I had to crack up about your nose falling off on the way to work. There is a whole gigantic section of our population in this country that has NEVER experienced their nose hairs freezing when you step out the door. A shame! Colin, and thanks for bringing a second opinion. I never thought it was the PRIMARY conversation topic, just that it was really high up there, like, go into a store and the clerk would mention it if you didn’t bring it up, that kind of thing. Here, nah, not so much. Shannon, exactly. I mean, it’s cold here, but it’s not COLD here!! Hwah. There is a world of difference between +10 and -10, and it’s so much different, say, than between +30 and +10. There’s a reason the north pole and Antarctica is not populated, is all I am saying! I was thinking of you around 5am last sunday. We were driving down 196 from Grand Rapids, on our way back to Minneapolis. The roads were really bad from about Saugatuck to the Indiana border. I worried that you guys would lose power. I’m glad everything is ok! Minneapolis had a pretty typical cold snap -24 without the windchill. It wasn’t overly exciting to come back to that. I did love driving through the snow in the dark in MI. It always seems so peaceful and magical. I miss it! Hi Em! I would say I wish you’d stopped by but I am not at my best at 5 a.m. 🙂 You zoomed right by us; we’re about a half mile from I-196 (it’s between us and the lake). I loved life in MN but goodness those windchills, no thanks, I will take the snow instead! Have a great semester, and go eat at Shuang Cheng and hit the Book House for me. aastricker, thanks for sharing that! Yeah, the one great thing about living here is you CAN still get outdoors all year round and won’t die by the experience. Love it. I’m amazed! You’re lettuce is beautiful!